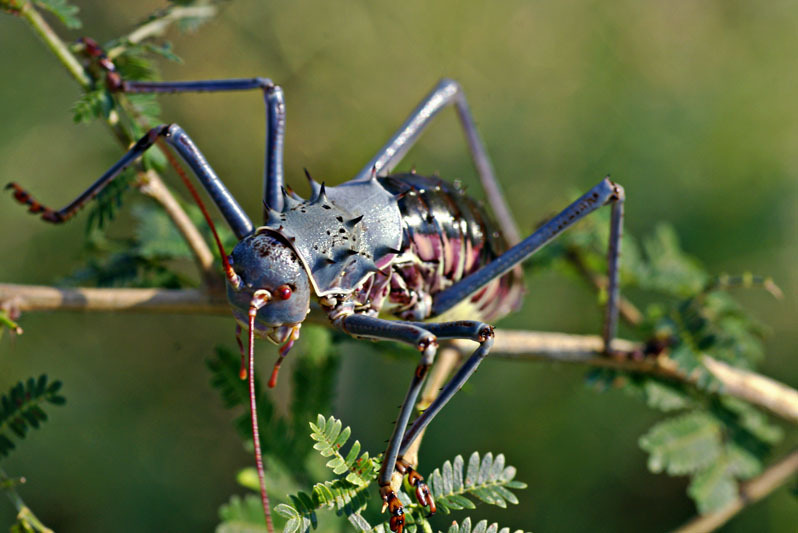 The armoured Ground Cricket (Acanthoplus discoidalis) also known as an armoured bush cricket or Gobabis prawn is considered a crop pest - eating grain and other sorts of plants. They also eat dead insects, including the dead of their own kind (they are famous for this). The pest control was to have the children step on as many as possible; however, now children go to school and this is no longer effective, so pestisides have come into use. A better approach is to harvest the crops before the next generation of eggs hatch and till the fields before the next generation comes up. Spraying the fields has been ineffective, but baiting the crickets off the fields and into poison has been effective. The full grown insect was nearly three inches long. I've heard of a spider that eats these crickets and also a few birds, including the stork, but the birds will only eat them at certain stages in their lifestyle. I was amazed at how many of the crickets I'd find in places - and then absolutely none in others. Another interesting (caution: this may be gross for some) was that since the body is so hard, their heads seem to pop off before the body is crushed. Inside is bright yellow, much like the inside of a chocolate Cadbury cream egg. With the head connected only by this goo and hanging down or missing, the legs walked back and forth as if trying to figure out what was going on. This happened a few times to a handful of the thousands of crickets we rode through on bicycle - a few were unavoidable. Another member of the group I was with reported seeing cricket heads floating down the river, expected to be the remains left over from a bird feast. I've looked on the Internet for other pictures of these guys and the others seem more brown. The ones I came across (in the North of South Africa and Botswana) were clearly blue, slightly purple with bright orange eyes. Since all wild African wildlife is new to me, sighting these things amazed me almost just as much as seeing an elephant on the safari! An excellent shot! Although we have seen thousands of them, I didn't manage to get a decent photograph! Just came back from Namibia where I saw tons of them. Loved your shot and - even more - your comment about finding them almost as interesting as elephants. I thought so, too. Made a video and looking at it properly at home, I realised that they've got such strong jaws, you can actually hear them chew in the video.... Sounds like cracking open a nut with a nutcracker... Very interesting, but also slightly disturbing animals, I find... But again: Great shot of yours.